The BlackBerry Passport sports a 4.5-inch square display of 1440 x 1440px. It's quite an unconventional resolution, but it's certainly not the first BlackBerry to have a square display. 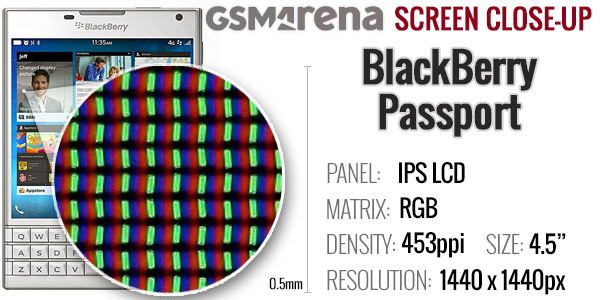 It is the densest, however, as the resulting pixel density is around 453ppi. Here's a look at the pixel arrangement under our dedicated microscope. Taking a look at the display in more detail, we found that it has some great contrast thanks to some deep blacks and not bad whites either. We were only able to measure at 100% display brightness as there is no way to stop the ambient light sensor from adjusting the brightness automatically, which ruined the 50% brightness test. Still, the contrast of the Passport's 4.5-inch display is comparable to the Apple iPhone 6 Plus, and beats out the units found on the LG G3 and the Sony Xperia Z3. Outdoor legibility is also good with a sunlight contrast ratio of almost 2.6, which places it well within the upper half of our charts. You should have no difficulty seeing what's on the screen in all but the brightest environments. Viewing angles also showed no contrast or color shift. The BlackBerry Passport sports a hefty 3,450mAh battery that should be able to post excellent numbers considering the hardware specs. The 4.5-inch is a square 1440 x 1440px display, which is the same amount of pixels as a standard FullHD display, so expect a similar battery draw to a 4.5-inch 1080p device. As expected, the two most battery-intensive tasks in our tests were video playback and web browsing. At just over 10 hours each, the two results are above average for its class. This comes alongside over 25 hours of 3G calling. 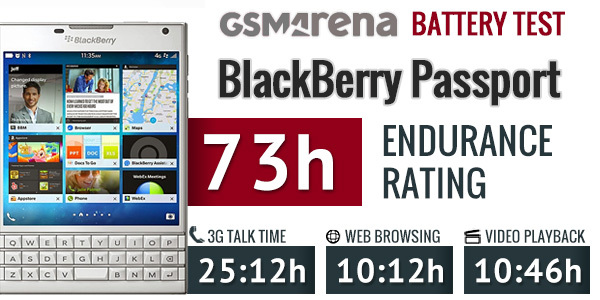 All three combined with the battery draw in standby, resulted in a very respectable 73 hours of endurance rating. 73 hours of endurance means that the BlackBerry Passport will be able to last just over 3 days on a full charge if you perform 1 hour each of watching videos, 3G calls, and web browsing per day. Considering the high display fidelity of 453ppi, this is a great result. BlackBerry designed the Passport to be a world-wide business phone and it's chock-full of telephony options. It features quad-band 2G and penta-band 3G connectivity, alongside a boatload of 4G options including support for up to 10 LTE bands depending on your market. Local connectivity is fully featured as well. Dual-band Wi-Fi a/b/g/n/ac handles local Internet connections and Bluetooth 4.0 handles accessories. There's also a microUSB port for data connectivity. NFC is also on board, allowing easy exchange of data. You can use the dedicated app to create tags (e.g. a tag with contact info), which you can send to another NFC-enabled phone. The app also handles reading tags and storing the data for when you're on the receiving end. You don't need NFC to transfer tags either - the Passport can create a QR code and read QR codes too, which is great for communicating with phones that don't have NFC. You can also share the Passport with an HDTV using Miracast. Wi-Fi Direct is also on board. While we're at it, we have to go over BlackBerry Link - the PC Suite for the Passport. The phone has the install file for your computer, just plug it in and install the program. Once Link is on your PC, the Passport will appear as a drive on your computer. You don't even need a USB cable to transfer files - as it will appear as a network drive if it's on the same Wi-Fi network as your computer. Link can schedule phone backups and automatic sync of content (both docs and multimedia). That's great with the Wi-Fi option - it will automatically sync your docs at work and then your music at home. A similar yet more robust feature is BlackBerry Blend, which is currently only available on the BlackBerry Passport and BlackBerry P'9983, because only they run the latest BB OS 10.3. Blend allows you to use your Passport for sending and receiving messages, checking your calendar or accessing all your device's files without ever touching the Passport itself. Instead, you use your your computer or tablet (iOS or Android) and do everything from there. Both Link and Blend are connected through a BlackBerry ID account.